Feel the pulse of Space City while staying at Houston Marriott Medical Center/Museum District. Our downtown hotel is just steps from world-renowned hospitals, research centers and clinical facilities including M.D. Anderson Cancer Center and Texas Children's Hospital. The Museum District, Rice University, Minute Maid Park and NRG Stadium are nearby. 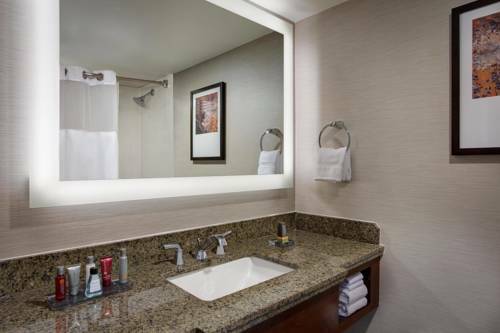 Settle into our modern accommodations with luxury bedding, marble bathrooms and flat-screen TVs with premium movie channels. Enjoy room service from Fresh Bites or savor classic American fare at Driscoll's, our signature restaurant serving a hearty breakfast buffet in addition to lunch and dinner. In downtime, head to our 24-hour fitness center or indoor pool to get in your daily exercise. If you're in town for a business or social gathering, take advantage of our premier event venue boasting 8,758 square feet of flexible space perfect for conferences, banquets, weddings and receptions. Let Houston Marriott Medical Center/Museum District exceed your expectations. Driscoll's: Chicken and waffles, shrimp tacos and cowboy ribeye steaks are among the many hearty items on the menu at Driscoll's. Our signature restaurant in the Houston Museum District and Texas Medical Center boasts a daily breakfast buffet. Paladora Lounge: Unwind after a day of exploring Houston at Paladora Lounge. Our contemporary bar and restaurant offers a full beverage menu plus light fare for lunch and dinner. This space is perfect for private work or social events. Fresh Bites: Fresh Bites, our refreshing concept on room service, allows you to enjoy a freshly prepared meal delivered directly to your accommodations. Service is available 24 hours a day for your convenience. University of Houston: Go Coogs!